I made this for Thanksgiving, but if you’re still not sure what protein to make for your winter holiday feast, I recommend Kreeli’s Seitan Roast Beast. It takes some time, but it’s incredible – the texture and taste is like nothing else. Certainly better than a commercial vegan roast. This entry was posted in Dinner, Guest Contributors, Photos on December 22, 2010 by malloreigh. It’s the holiday season! Because Kaylie’s from Albuquerque and I’m from Calgary, both of us will be going to visit our families for the holidays. You’ll see reviews of vegan eating in ABQ and CGY (both of which are kind of cowboy towns) as well as meals we’ve made in our parents’ kitchens. Happy holidays, everybody! We also made a recipe ‘zine to give away to friends and family for Christmas. If you want one, let us know! This entry was posted in Meta on December 18, 2010 by malloreigh. 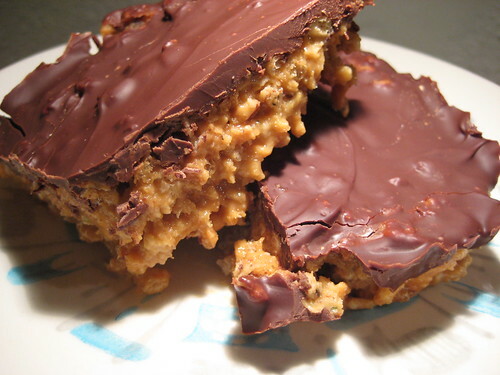 I came across swell vegan while searching for something to make that involved both peanut butter and chocolate. I wasn’t even looking for vegan recipes (I’m open to egg replacement) and there she was, saving my evening! Of course, maybe I’m a bit biased; there’s something great about finding other queer vegans. If I feel an affinity with other vegans, imagine other vegans who also share another way I’m “alternative” or marginalized! So, all you have to do to win my love is be a queer vegan, obviously. This entry was posted in Meta on December 17, 2010 by malloreigh. This salad dressing was so unbelievably easy to make and delicious. Our friend Jocelynn got me a Magic Bullet for my birthday, and it is such a great tool for salad dressings! Any blender will do, or even a fork if you are low-tech like that. Mix together and serve over greens. This entry was posted in Photos, Recipes, Sauces, Sides and tagged cardamom, nutmeg, orange on December 10, 2010 by malloreigh.